I’d previously never used an electric trolley until last week. I think it had something to do with being traumatised as a kid when watching someone drive theirs into a lake. But after taking the new PowaKaddy Freeway Digital (Lead Acid) for a spin at London GC, the only thing I can imagine getting rid of right now is my double strap. Quite frankly, the new Freeway Digital delivers everything it promises from simple instructions, which even someone as technologically clueless as myself could work out, to the trolley’s lightweight fully foldable design that fits neatly into the boot of the car. The Freeway Digital features a new ambidextrous soft T-bar grip handle with responsive speed controller and a choice of nine different speeds that puts you in complete control of your trolley. You can also send the trolley on ahead by 15, 30 or 45 yards while you chat away to your playing partners. Just make sure there’s plenty of grass in front of you. I recommend you do some qualifying laps with it before you try and impress your pals! The trolley also possesses a framework that would leave Jeremy Clarkson in awe with its tough ultra lightweight SPORTY AMST alloy chassis, low profile five spoke sport wheels and a near noiseless 200-watt motor. While folding down the trolley initially looked like something more likened to the Generation Game, it’s rather straightforward. Three touches, in fact. Just slide the different compartments down and remove the battery. The PK Freeway Digital, available in both white and black, also has a unique interchangeable built-in battery connection for both 18-hole and 36-hole Lead Acid and 18-hole Lithium batteries. I would go as far to say that I’ve never felt more refreshed playing golf before and it showed in my driving and iron play. I missed just two fairways on the International course and hit 13 of 18 greens in regulation. With more time spent travelling to the next shot than actually hitting the ball, tiredness and loss of performance is a real issue. 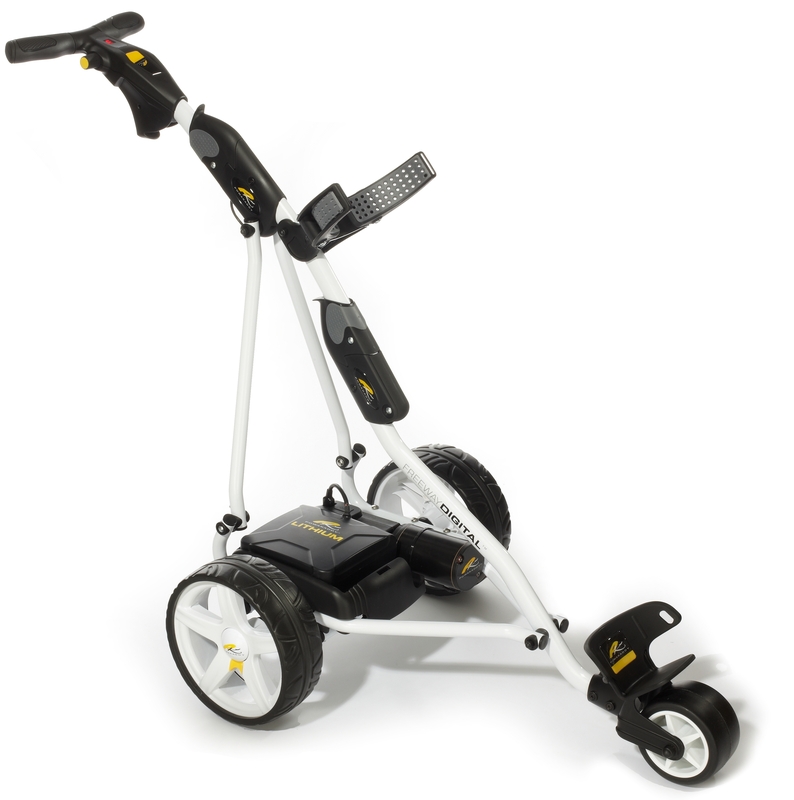 Powakaddy’s lightweight frame of 8.8kg and stylish ergonomic design ensures energy levels go into the swing rather than lugging your bag around like the Hunchback of Notre Dame.